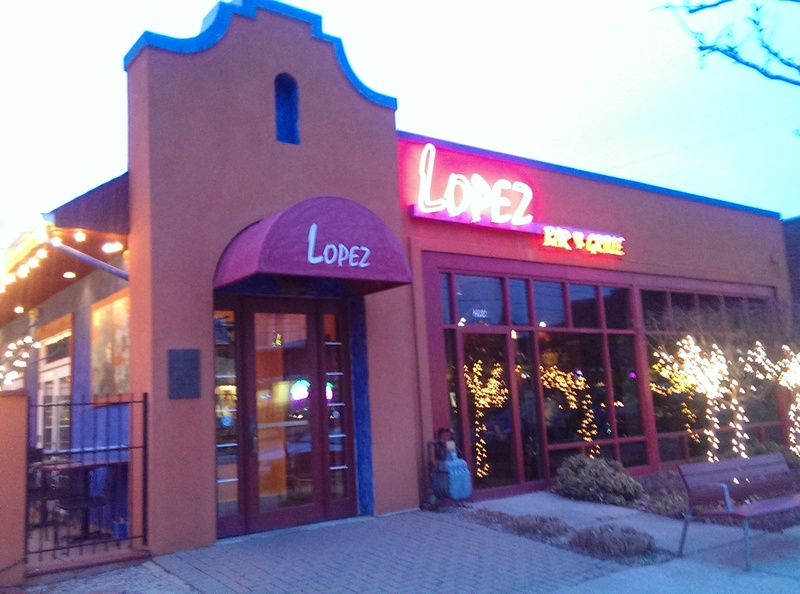 Lopez began in 1979 as Lopez y Gonzalez, which was conceived as a multi-international chain of cutting edge Mexican restaurants. The only cities where the owners succeeded are Palm Beach, Beverly Hills, Mexico City, and Cleveland Heights. Celebrity chef Rick Bayless opened the restaurant as its first chef in 1980. Lopez has been turning out southwestern food and drinks since 1979. Lopez y Gonzalez was located at the corner of Washington Boulevard and Lee Road and closed in 1998. Lopez on Lee opened in 2001. I hadn’t been back after an unfortunate incident with a bartender in 2009, but decided I needed to check it out again. We went on a Monday night when they don’t offer valet parking, so I parked in its small parking lot. But valet parking is only $3, which is a small price to pay if the heavens are threatening to open up that night. 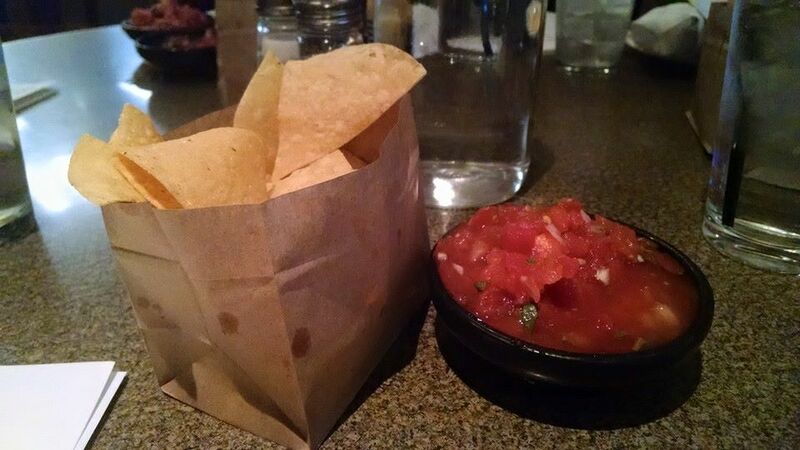 I arrived a few minutes late to find my friends there, water glasses filled and chips and salsa waiting for me. It was a nice beginning to the evening. 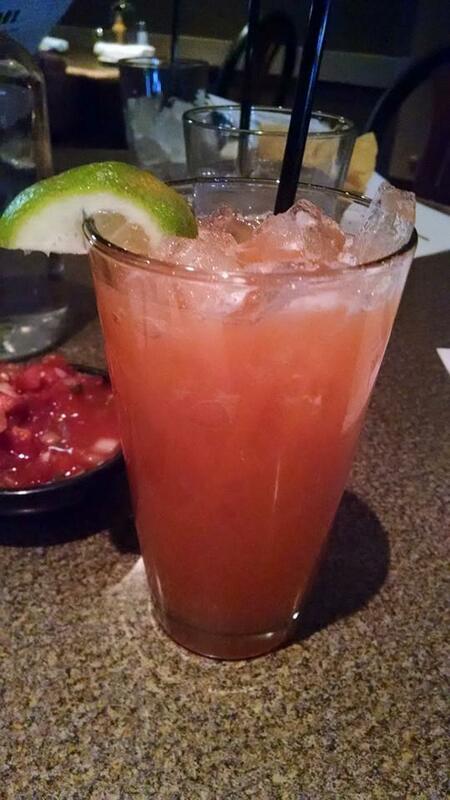 I have been on a blood orange kick lately, so I ordered a tall blood orange margarita. It was during happy hour, so I got it for $6 instead of $12! It was delicious. Not too sweet, not too bitter and not too potent. It definitely tasted as if they used fresh blood orange juice. I sucked down two that evening. They were that good. 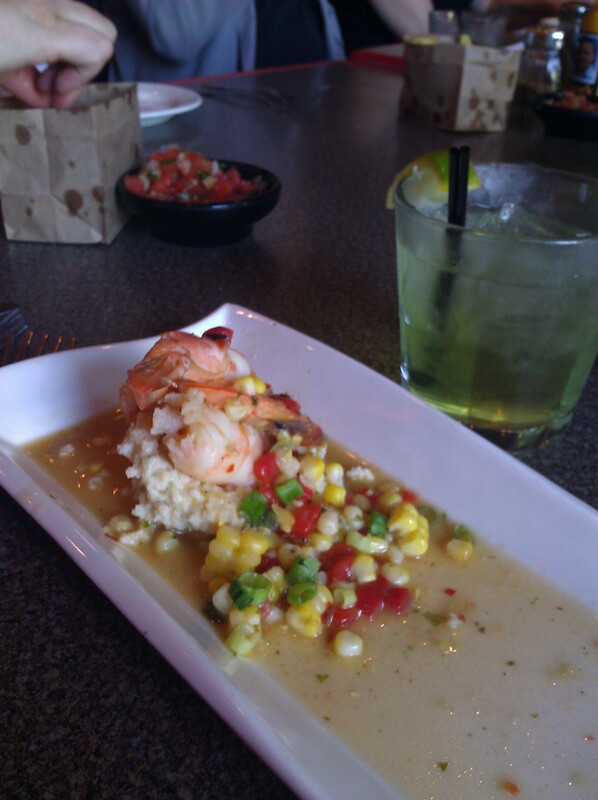 I’ve had their shrimp ‘n’ grits before and was seriously tempted to order it again. It features corn, chiles, smoked gouda, roasted peppers and scallion. It has a nice heat to it thanks the jalapenos and chiles in the grits and sauce and is outrageously good. The photo here is just a sample portion from when I was on the NEO Food Tour of the Cedar-Lee district. Instead I ordered the guacamole trio for the table to start. My favorite was a blue cheese and bacon guac. I learned later it is the Iron Chef guac created by Michael Symon with blue cheese, sage and house-cured bacon chunks. Yeah. Big fan. The cheese and bacon complemented each other well and were a good match for the fresh creamy and chunky avocado. 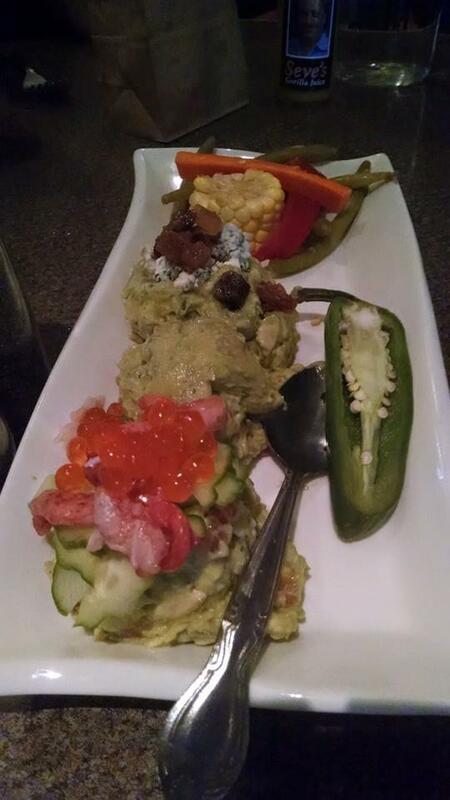 The other two flavors (lobster guac with salmon caviar and the traditional) were also really good. My friend B. is a huge taco fan, so it was obvious what we were all going to order.The tacos are pricy, but the flavors are inventive, the ingredients are upscale, and they are actually quite filling. I had a tough time deciding which I wanted and how many I wanted (there is a minimum order of two). I ordered a trio and ended up taking half of each one home with me. Next time I will just order two. 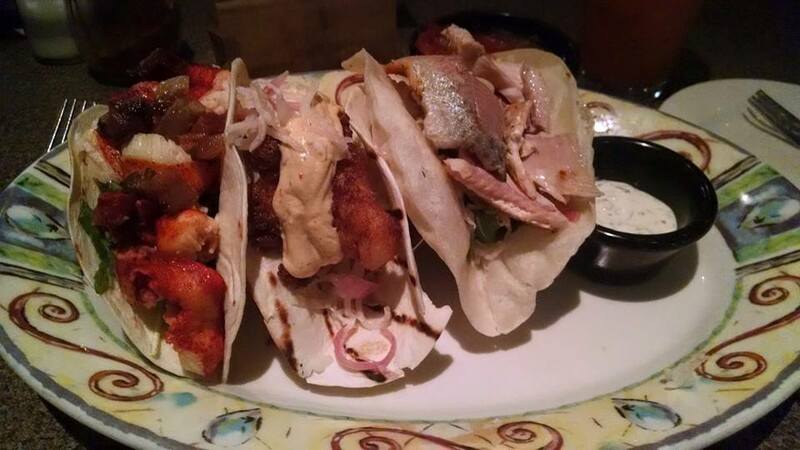 I knew I wanted to order the Buttery Lobster Taco, and that was in fact my favorite taco out of the three I chose. It features butter-poached lobster, bacon, arugula, smoked tomato and guacamole. The lobster was fresh and tender, and the flavor of the smoked tomato really came out when it popped in my mouth. 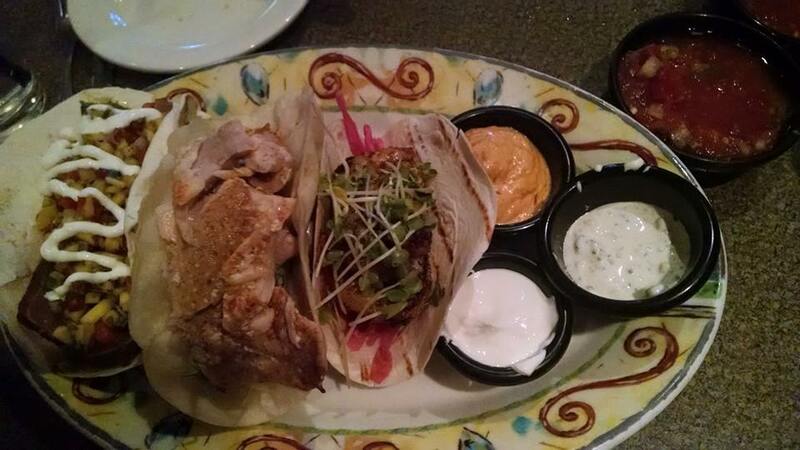 My second favorite was the Smoked Trout Taco. It comes with jicama slaw and a habanero corn mustard crema. The server told me the cream was a little spicy, so I ordered it on the side just to be safe. After dipping my fork to test it I quickly slathered the entire portion on the taco. The crema was delicious and not spicy at all. I chose the Ancho Battered Catfish with jicama slaw and a gaucho crema for my third taco. The catfish was a good portion of fish and it was perfectly fried. It was good, but just couldn’t compare with the other two tacos. 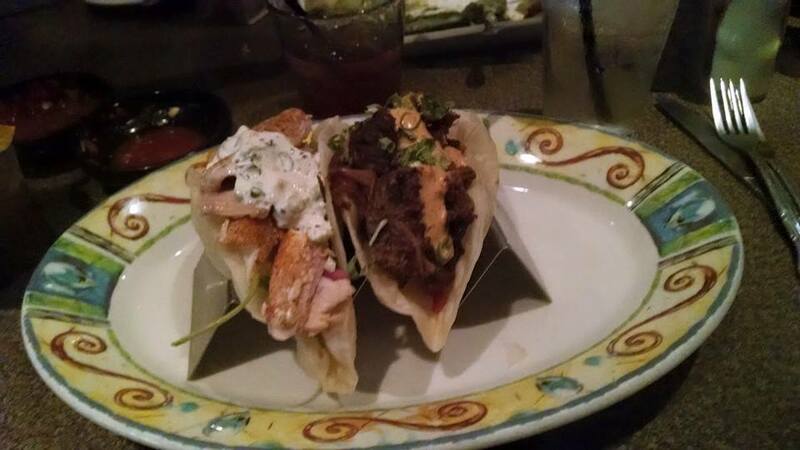 I was extremely pleased with my meal, as were my dining companions who both ordered the trout, but one ordered the Smoked Brisket Tops taco and the other ordered the Mole Dusted Seared Tuna and the Spicy Grilled Shrimp. The two of us who ordered 3 tacos ended up with small to-go boxes. None of us had room for dessert. I plan on going back soon to try the lobster enchiladas, the fajitas, and the garlic and spinach stuffed trout (not necessarily in that order). Now that the weather is getting nicer I plan on enjoying some more blood orange margaritas on their inviting patio. They take reservations through Open Table.